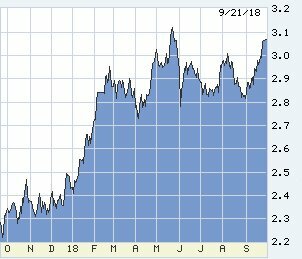 The move is very slow, and not yet a true “breakout,” but long-term rates have crept up to a new level and are poised for more, above 3.00% for the 10-year T-note and above 5.00% for lowest-fee mortgages. The Fed will conclude its next meeting on Wednesday, but will say as little as possible then and close to nothing until after the election. If this is the Fed’s track, why is the stock market drunk again? Four things. First, relief that North Korea’s nukes are no longer a risk of war. The US announced that denuclearization negotiations will be complete in 2021 — not de-nuking, just the talking. Shoot, by then we’ll all be riding in autonomous electric cars, the juice from fusion. Second, relief that China has under-reacted to Trump’s new tariffs. China did not cancel new talks, and the talks are with Secretary Mnuchin, not the White House loons. We might actually, quietly get a deal protecting US intellectual property, aiding US exports to China, and US business operations there. The trade deficit itself is not a problem, which the Loon in Chief does not understand, but backing away from public blustering is good. Third, also a matter of loons versus the world, is the effect of the tax and spending bills railroaded through Congress last year. The 2018 federal deficit will be about $800 billion, up 20% from last year (going higher), certainly boosting the economy. Any economy at full employment and hustling north of 3% GDP should be a fountain of tax revenue. Not. Revenue is down about 4% from last year, led by corporate tax revenue down 20%. Fourth, we are now five years into an all-time game of businesses buying back their own stock — averaging $600 billion per year. As we discovered in the Great Bubble, put that kind of money into empty condos and even they will rocket. Global business profits are without precedent, so big that businesses cannot put the money to work in new ventures. Paying out the loot in dividends would create a tax burden for stockholders (and pay the bills for our society), so instead buy back stocks and send prices to infinity, and beyond. All of those overseas profits to be repatriated, $3 trillion? Dribbling in, unlikely ever to reach $1 trillion, but businesses using the funds for more stock buybacks. Every 90 days the Fed publishes Z-1, the flow of all funds inside our economy. 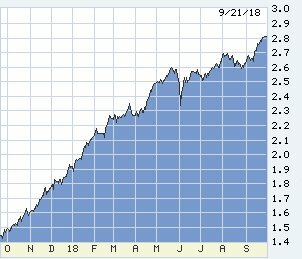 From January 2015 through mid-2018, the market value of US publically traded stocks has jumped from $26 trillion to $34 trillion. Inclusive of all stocks public, private, and overseas stocks held here, from $37 trillion to $48 trillion. In three-and-a-half years, roughly double the rate of nominal (not inflation-adjusted) GDP growth. Great news if you had money to put in the market. Changing subject… here at the 10th anniversary of Lehman’s collapse I had hoped that retrospectives would at last help the public to understand the cause of the Great Recession, and as a bonus document the fantastic courage and success of Ben Bernanke’s rescue of us. Okay, sir: You did. One of dozens of central players in the greatest financial fraud of all time. It’s been a tough week for the law: our common misunderstanding of the Supreme Court as political arbiter, and Trump’s misuse of the law as a personal weapon of attack and defense as taught to him by Roy Cohn (no relation to Gary; google Roy). Fraud is hard to prove because of the need to document intent. “Fixed income” on The Street means IOUs — bonds, mortgages and all. US fixed-income desks for generations have been the finest underwriters of credit risk in the world. The IOUs which failed from 2007 forward had passed across big-firm fixed-income desks. Not passively: these desks designed and vacuumed up trillions of dollars of trash IOUs annually from 2002 forward, ignoring their own quality rules, and then redistributed the trash, misrepresenting to rating agencies and buyers alike. Two pieces of evident intent stand in plain sight. First the IOUs themselves, in two halves, mortgages and not. We have forgotten the trillions of “not” — “off balance sheet” undisclosed big-bank trickery, yield- and price-guarantees. Stick with mortgages. By 2002 in plain sight on every mortgage desk in America were “2/28” loans which could not possibly survive the rate hit at the end of two years, but proliferated by serial cash-out refinance until the Ponzi parade stopped. And in plain sight the large-scale stoppage of underwriting of credit and income especially on low- or nothing-down loans. Mr. Greenspan will go to his grave without explaining how he missed it, or apologizing. Sadder to me, Mr. Bernanke — our financial version of Sergeant York — will not address the Fed’s failure. Bernanke this week published at Brookings a numbing paper describing the end of the world in 2008 but adding nothing to our understanding of how the Fed missed the cause. It missed the suicidal structure of IOUs, and the geometric explosion in trash volume in the Fed’s own contemporaneous accounting. Z-1 again: it tracks mortgage flows all the way back to WW II. Account L.218 is US home mortgages, all of them. The sub-line “ABS issuers” is by definition non-Fannie-Freddie-VA-FHA and non-bank; it is “asset-backed securities” holding mortgages. Until 2002 those were mostly jumbo loans and “Alt-A” loans well-underwritten but odd (an investment condo in Aspen). Then the new subprime mortgage securities fell into that ABS line. Total US mortgages in 2002, including Helocs and 2nds: $6.4 trillion. The ABS fraction: $500 billion. Helocs, $500 billion. Five years later, 2007: total mortgages were $11.2 trillion. The ABS fraction: $2.2 trillion. Helocs, often the “piggyback” in pernicious 80-20 packages had bloated to $1.1 trillion. Today, ABS have defaulted back to $457 billion, Helocs to $545 billion. How? Neither the Fed nor anyone else wants to answer, nor did indolent Attorney General Holder ask. And so the dozens of Gary Cohns ride off free into their arrogant sunsets. Bernanke’s long paper has one splendid chart of the disaster. Unfortunately his comments are limited to the consequences of the collapse of the market value of trash, not one word on how we created it and failed to notice it. The chart is the market value in percent (100 is par value, 100 cents on the dollar) of triple-B rated slices of the subprime loans in Z-1 L.218, “ABX” all-ee same-ee as ABS. Civilians and too many professionals mark the onset of disaster with Lehman; most of the few of us who have worked life-long with MBS knew in the summer of 2007 that a landslide had begun which could not be stopped by any normal, historical means. © 2019 8z Mortgage, Company NMLS #386626. All Rights Reserved. Loan products are not available outside of Colorado.